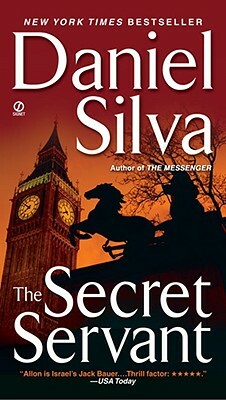 A terrorist plot in London leads Israeli spy Gabriel Allon on a desperate search for a kidnapped woman in this thriller from #1 New York Times bestselling author Daniel Silva. While in Amsterdam, Israeli intelligence officer and master art restorer Gabriel Allon discovers a plot that is about to explode in the middle of London. The daughter of the American ambassador is to be brutally kidnapped. But Gabriel arrives too late to save her. And when he reveals his face to the plot’s masterminds, his fate is sealed as well. Daniel Silva is the #1 New York Times bestselling author of The Unlikely Spy, The Mark of the Assassin, The Marching Season, and the Gabriel Allon series, including The Kill Artist, The English Assassin, The Confessor, A Death in Vienna, Prince of Fire, The Messenger, The Secret Servant, Moscow Rules, The Defector, The Rembrandt Affair, Portrait of a Spy, The Fallen Angel, The English Girl, The Heist, The English Spy, The Black Widow, and House of Spies. His books are published in more than thirty countries and are bestsellers around the world.